The Patek Philippe Boutique located in the Tiffany & Co. flagship New York store is celebrating its fifth anniversary with the introduction of a men’s and a ladies’ wristwatch jointly developed by Patek Philippe and Tiffany & Co. The timepieces are double-signed Patek Philippe and Tiffany & Co. and will be sold in a limited edition exclusively through Tiffany’s Patek Philippe Boutique and other authorized Tiffany & Co. locations nationwide. The Ladies Gondolo timepiece (Ref. 4987G) is inspired by the Art Deco period and features a curved, tonneau-shaped case in 18K white gold accented with 164 round brilliant-cut diamonds (0.63 ct). Two dial options marked with Patek Philippe and Tiffany & Co. signatures are offered: a mat blue sunburst dial with white painted Roman numerals featured on a dark blue satin strap or a white mother-of-pearl dial with powdered gold Roman numerals featured on a vanilla satin strap. 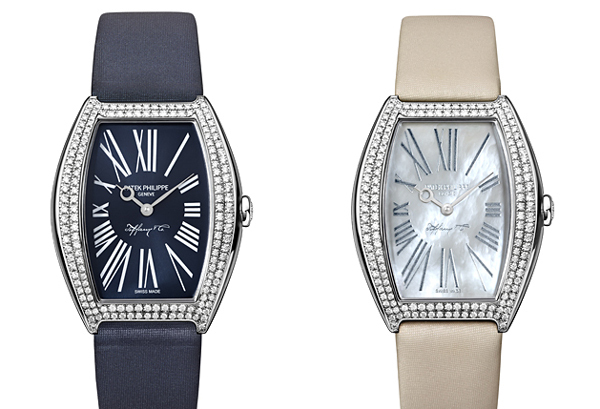 The limited edition comprises 50 pieces of the ladies’ model, 25 of each dial version. The new Men’s Annual Calendar watch (Ref. 5396G) was created especially for the boutique’s anniversary. This elegant timepiece in 18K white gold features day, date, and month in apertures, moon phases and 24-hour indication on a black dial and a mat black alligator strap. The black dial is double-signed by Patek Philippe and Tiffany & Co. The sapphire-crystal case back reveals the caliber 324 S QA LU 24H and features an exclusive engraving “Patek Philippe – A Shared Vision – 2008-2013 – Tiffany & Co”. The limited edition comprises 100 pieces of the men’s model. Opened in 2008, the 280 square meter boutique was Patek Philippe’s first boutique in the U.S. Located on the mezzanine of Tiffany’s Fifth Avenue flagship store, the New York boutique showcases current collections, as well as timepieces on loan from the Patek Philippe Museum in Geneva that embody the tradition and innovation for which the famous watchmaker is renowned. These rare timepieces chronicle the art of horology and highlight the shared history of Patek Philippeand Tiffany & Co. The partnership began in 1851 with a handshake agreement between the companies’ founders that was based on trust, integrity and dedication to craft. Their shared values fostered a relationship that continues to promote the highest standards of excellence. Back in 2001, Patek Philippe and Tiffany & Co. celebrated the 150th Anniversary of their partnership with the introduction of the “T 150” limited edition timepiece, a truly rare and valuable timepiece for watch collectors featuring a complicated movement with annual calendar, moon phases and an exquisite engraving on the caseback. In 2008, Patek Philippe organized a rare two-city exhibition titled “The Values of a Family Watch Company” to showcase the most complete set of Patek Philippe timepieces ever shown outside of Switzerland. Hosted at Tiffany & Co. in New York City then in Beverly Hills, the exhibition illustrated the intrinsic values and philosophy of the Patek Philippe brand, including tradition, heritage, innovation and the quest for unrivaled excellence in watchmaking. Tiffany & Co. operates jewelry stores and manufactures products through its subsidiary corporations. Its principal subsidiary is Tiffany and Company. The Company operates TIFFANY & CO. retail stores and boutiques in the Americas, Asia-Pacific, Japan, Europe and the United Arab Emirates and engages in direct selling through Internet, catalogue and business gift operations. 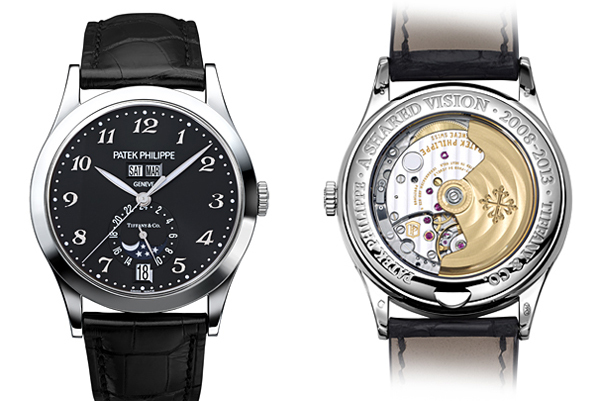 Since 1839, Patek Philippe has been continuously perpetuating the tradition of finest Swiss watchmaking. Based in Geneva, the independent watch manufacturer enjoys total creative freedom to design, produce, and complete what experts agree to be the finest timepieces in the world. The company’s precious, classically elegant watches, proudly handed down from one generation to the next, are the result of advanced technology combined with ancestral watchmaking know-how. Relying on its extraordinary experience, Patek Philippe’s tradition of innovation is crowned by an impressive portfolio of more than 80 patents. Limited edition of 50 pieces, 25 of each dial version. Caliber E 15. Quartz movement. Tonneau-shaped case. Bezel set with 164 diamonds (~0.63 ct). Dial: white mother-of-pearl with powdered gold Roman numerals or matt blue sunburst with white painted Roman numerals. White gold Breguet hour hand, white gold feuille (leaf-shaped) minute hand. Satin strap: vanilla (white dial) or dark blue (blue dial). Prong buckle. Water resistant to 30 m.
Case dimensions: 34.20 x 28.76 mm. Caliber 324 S QA LU 24H. Mechanical self-winding movement. Exclusive “PATEK PHILIPPE - A SHARED VISION - 2008-2013 - TIFFANY & CO.” engraving on the case back. Annual calendar. Day, date, and month in apertures. Moon phases and 24-hour indication. Sweep seconds hand. Black dial, applied gold Breguet numerals. White gold feuille (leaf-shaped) hands. Strap: alligator with rectangular scales, hand-stitched, matt black. Fold-over clasp. Sapphire-crystal case back. Water resistant to 30 m.